A late Kevin Niblock goal gave the Saffrons a narrow win over London in the All-Ireland SFC first-round qualifier at Ruislip on Saturday. Aodhan Gallagher netted on 20 minutes to put Antrim five points in front but the Exiles hit back through goals from Ciaran McCallion and Eoin O'Neill. London led 2-5 to 1-5 at the break and were two points ahead with just six minutes remaining. 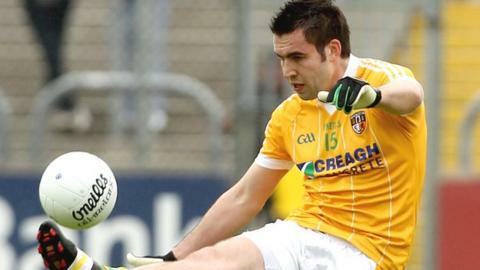 Substitute Niblock struck the decisive goal and Antrim held on for victory. The Ulster side was forced into a late change when Martin Johnson came in for the injured Paddy Cunningham. London had a stiff breeze at their backs in the first half but Antrim made a blistering start and Gallagher struck a shot off a post before finding the target. The hosts fought back and McCallion's fine goal was followed by O'Neill netting just before half-time. London should have been further ahead and their nine wides were to prove costly. Antrim drew level soon after the restart, only for the Exiles to regain the lead and move two clear. Niblock hit the net and Tomas McCann added an injury-time point to seal the win.